I recently went to Spain on my holidays. I so dislike the boarding process that I decided to pay for priority boarding. It avoided some of the check in procedures, although not as many as I would have hoped. This is the way things work in public transport and the more money you have the better your seats. It is difficult therefore when we come to thinking about the Kingdom of Jesus. There is no queue jumping, and we have to learn to put others before ourselves. We read in our lesson today that the disciples found this hard. They wanted to have the best positions, the best rewards. They needed to understand that Jesus turned power on it head. The church has been as bad at this as anybody and we all need to learn the basic lessons. If the disciples are to gain lasting dignity they must be willing to be a servant "to all." They must learn to receive the child in Jesus’ name. At the time of Jesus children were lacking in any power they had no status and they were very vulnerable. The disciple is to be just like that, Jesus says, "welcome the child" into their lives – accept being vulnerable and therefore dependent on God. After leaving the mountain Jesus and his disciples went on from there and passed through Galilee. He did not want anyone to know it; for he was teaching his disciples, saying to them, ‘The Son of Man is to be betrayed into human hands, and they will kill him, and three days after being killed, he will rise again.’ But they did not understand what he was saying and were afraid to ask him. It’s not difficult to imagine the disciples are beginning to flex their elbows in the gospel reading today. Jesus tells the disciples that He will be delivered into the hands of men who will put Him to death. And, whilst the next verse tells us that the disciples did not understand what this meant, perhaps referring to the fact that Jesus tells them that after He is killed He will rise again, they then seem to be discussing who among them is the greatest. It’s logical to assume that in some shape or form they were trying to decide who should take over from Jesus when He goes. If this is the case, then rather than focusing on the mission and ministry which Jesus has started, and to which we are all called to continue, they seem to be locked in discussion about who might have the best leadership characteristics to pick up the mantle of Jesus. Who has the most influential way of speaking, who might have the most persuasive voice with the Romans and the Jewish authorities? Who could engage the most with the crowds and who could equally engage with the rich, famous and influential? Whose voice and face will resonate with the public as they look to challenge some of the established thinking and understanding? Were the disciples who had witnessed the Transfiguration (which has just happened) better than the rest? It looks like some serious succession planning may have been happening on the road! Even if Jesus did come back as a King or Messiah, He’d need a very capable Chief of Staff or Head Ambassador to keep things on track. There could be challenging times ahead and their decision about a succession plan and who should be in charge of operations could be important – they need to get it right. Yet when challenged by Jesus the childishness, futility and misguidedness of their arguments must have seemed embarrassingly obvious. A Prayer of St. Chrysostom Almighty God, you have given us grace at this time with one accord to make our common supplication to you; and you have promised through your well-beloved Son that when two or three are gathered together in his Name you will be in the midst of them: Fulfill now, O Lord, our desires and petitions as may be best for us; granting us in this world knowledge of your truth, and in the age to come life everlasting. Amen. Lord Jesus, you calmed the raging storm and tamed the surging sea—calm the tempest of indecision and cure the seasickness within our souls. Forgive our faint-heartedness. Grant us not just the courage to do the right thing, but also the wisdom to figure out just what that right thing is. Reassure us, Lord, that even if the right course of action hurts us in the short run, that you will ultimately reward our faithfulness and keep us safe. Thank you Lord that I can see ..... so many are blind. Thank you Lord that I can hear ..... so many are deaf. Thank you Lord that I can walk ..... so many are crippled. Thank you Lord that I have food ..... so many are starving. Thank you Lord that I have shelter ..... so many are homeless. Thank you Lord for the touch of a friendly hand ..... so many are lonely. Thank you Lord for the Cross you share with me and for all your blessings ..… so many deserve them better. I recently went to Spain on my holidays. I so dislike the boarding process with the searches and queues, that I decided to pay for priority boarding. It avoided some of the check in procedures, although not as many as I would have hoped. This is the way things work in public transport and if you are prepared to pay, you can also have better seats. It is difficult therefore when we come to thinking about the Kingdom of Jesus. There is no queue jumping, and we have to learn to put others before ourselves. We read in our lesson today that the disciples found this hard. They wanted to have the best positions, the best rewards. Just think of the irony of it all. Jesus is speaking about his death for others, the laying down of his life for others. Meanwhile the disciples are arguing among themselves who will be the one to bask most in the reflected glory of Jesus the Messiah. It was agreed that Jesus would be king, but they argued about who would be the next in line, who would speak for Jesus when he was busy, who would fulfil special engagements when he was not available? All of these things had to be agreed. In the gospel passage today Jesus shows us that we need to guard against purely personal ambition, that we should not seek to put ourselves first. True greatness lies not in self promotion, but in self-denial and in child like joy and obedience to Him. Greatness is not measured by the power and influence we have over other people, but by how we serve them. So who will be qualified to be the ambassador for Jesus? 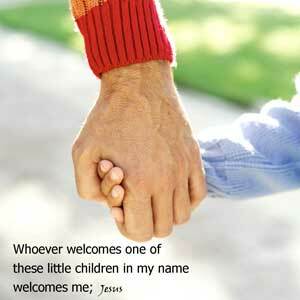 Jesus uses the example of a child. Not an obvious choice, since children are obviously immature and naive. When we think of children we do not regard them as an example, rather we expect from them obedience and respect. However Jesus knew that the secret to successful living was to be found in having certain childlike qualities. Children are open and willing to learn, they are not restricted by their prejudices and ingrained attitudes. It is a sad indictment that the older we get, often the more set in our ways we become. Children are much more open to new ideas, possibilities and opportunities. As much as children are flexible, older people can become rigid and inflexible. It is true that children lack experience, but it is exactly that lack of experience which makes them open to new experiences, hence they are more spontaneous and fun. As disciples we all need to understand the call of Jesus for a radically different way of living. Following Jesus means that we are prepared to share with him in turning the world’s standards on their head. To do this it requires a whole revolution in the way we think and act. This requires us to go back to basics and start learning all over again. Of course throughout history the church has been as bad at this as anybody and we all need to learn the basic lessons. If the disciples are to gain lasting dignity they must be willing to be a servant "to all." They must learn to receive the child in Jesus’ name. At the time of Jesus children were lacking in any power they had no status and they were very vulnerable. The disciple is to be just like that, Jesus says, "welcome the child" into their lives – accept being vulnerable and therefore dependent on God. This is not an encouragement to be childish, but it is a call for us all to consider in what ways we might be more childlike and to take ourselves less seriously. This is good for healthy living, but it is also essential for the gospel. If we fail to have an open and childlike attitude, then the message of Jesus could never be appreciated. Access to the Kingdom of God required a willingness to see miracles with child like eyes. The desire and willingness to share the good news of the Kingdom required further childlike qualities, enthusiasm and joy. In our Gospel reading today we are told about a time when Jesus is travelling along the road with his disciples. They were on the way to Capernaum but they travel quietly, secretly. The reason for this is clear, Jesus is seen as the leader of a movement, primarily of poor people, which the religious and political leaders correctly saw as a threat to their power. He therefore didn't advertise his presence because he had enemies. The Pharisees and the Herodians have been after him since Chapter 3 Verse 6 and they want him dead. There are plots to silence him once and for all. Jesus knows that he will soon be betrayed and die and he wants to get important teaching into the minds of his disciples. Three different times in Mark's gospel Jesus warned his disciples about the tragic end that awaited him in Jerusalem — betrayal, condemnation, suffering, rejection, violent death, and then resurrection. All three times the disciples responded to Jesus with objections, disbelief, fear, and ignorance. They repeatedly demonstrated how badly they misunderstood the true nature of his redemptive mission. After his first "passion prediction," Peter objected: "Lord, this shall never happen to you!" But Jesus rebuked Peter for trying to prevent his sufferings: "You do not have in mind the things of God but the things of man" (Mark 8:33). After the third prediction (10:32ff), James and John asked Jesus for positions of glory. The ten other disciples indignantly objected, clearly worried that James and John might gain some advantage over them. After Jesus's second prediction in the gospel for this week, the disciples argued among themselves about who was the greatest (Mark 9:34). Jesus responded to his disciples in two ways. First, he gave them a teaching: "If anyone wants to be first, he must be the very last, and the servant of all'" (9:35). Second, Jesus dramatized a parable. In a piece of street theatre that illustrated his teaching, he placed a little child before the disciples. He then embraced the child and said, "Whoever welcomes one of these children in my name welcomes me; and whoever welcomes me does not welcome me but the one who sent me" (9:37). To welcome a child is to extend the simplest of acts to an individual whom society dismisses as perhaps cute but ultimately insignificant, someone who lacks any accomplishments, greatness, status, or pretensions. By extension, Jesus invites us to welcome every person in the same manner, without regard for external measures of their worldly importance. The simple act of welcoming another person in that way, Jesus says, is to welcome him, and in turn to welcome God the Father who sent him. To live as a child is to live free of the self-justifications that adults use to prove their worth, and the heavy burden of self-consciousness about our status. To live like a child, says Jesus, is the only way to enter his kingdom. Anyone who wants to be a leader must be "last of all" and, not only that, but "servant of all" as well. The disciples have a heirarchical understanding of leadership. For them, and for most people, the leader is the one who has climbed their way sufficiently up the greasy that they hold power over those below them. They get the bigger office, they are the ones that people want to please. The challenge for us is to take these words of Jesus to heart and realise that greatness needs to be understood in a radically different way. By receiving one of the least and insignificant people in our culture we are also receiving Jesus and not even him, but God. It is hard for us because we are trained to think that we get on by focussing on how to achieve upward mobility, Jesus tells us that we get on if we treat well people of little public regard.